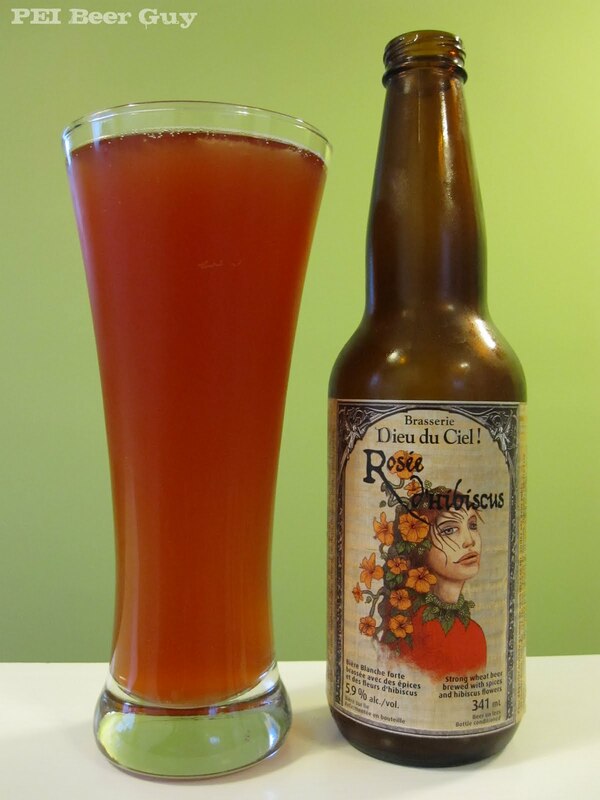 In this summery beer from Dieu du Ciel!, there is almost no head, and not much of what there is stays for long - just a few bubbles in the glass, and nothing really on top. The colour is fantastic... it's the colour of rhubarb soup (yes, it exists) or broth - almost an amber beer colour, but with a decidedly more rose / pink / red hue to it and a bit of "orangeness". The smell is different... it reminds me of some froo-froo soaps I've used to be honest... a grapefruit one comes to mind... not quite roses... it must be hibiscus, I guess... I just can't recall exactly what they smell like to be honest. Maybe they smell like this. The taste is cool, for lack of a better term - really fresh and refreshing. There is a bit of straw / wheat... and some berry / fruit, for sure. It's obvious without being dominant or very in-your-face. The mouthfeel is light without being watery. The carbonation and overall feel of the beer kind of lift into the roof of your mouth and stay there. You can feel it stick and then fade as your tongue goes a bit dry. There's a smidge of a tingle and sweetness (almost tartness) to it that reminds me of "girly wine" (what my mother calls Boone's) or champagne - almost like some wedding punch I have had a few times... some orange/wine-champagne/"red-something" punch. This is a great beer for the summer. It'd go very well with a salad - greens and strawberries, raspberry vinaigrette, perhaps.